Dental Implants: What are they and what do they cost? In order for a dental implant to be installed, the tooth it is replacing has to be removed if it hasn't already come out previously. It's just like any other tooth extraction procedure and simply requires removing the entire tooth from the gum. The cost of extracting a tooth varies from €90 to €150 depending on whether or not surgery is required to perform the extraction. Titanium is a very strong metal that is biocompatible (this means that the metal doesn't cause any undesirable effects in the body and that the body does not reject the material). What's even better about titanium is that when it is placed adjacent to bone, it will normally fuse with the bone tissue, via a process known as osseointegration. This makes a titanium implant very strong, and it won't move around. In fact, a titanium dental implant is actually much stronger than a real tooth root. The cost of installing the implant is €700. The more time that elapses between when the implant is installed and when a crown (artificial tooth) is fitted, the stronger the implant will be and the less chance there will be of any problems occurring. In general, it's unwise to fit a crown earlier than 3 months after the implant has been installed, and in many cases it will be necessary to wait longer, sometimes as much as 6 months. Once the dentist is certain of sufficient osseointegration to support your new tooth, the next step is to fit an abutment onto the implant, and the crown is then bonded to the abutment. This part of the procedure costs a further €700. A lower cost alternative that may be suitable for some patients is a procedure known as "all on four" or "teeth in a day". In this case a set of dentures is created and four implants are placed into the gum line, which will support the dentures. This procedure costs €9,999 and takes less than one day to complete, not including the preliminary examination and CT scan. Unlike ordinary dentures, these ones don't have a risk of slipping and sliding around, don't need to be removed, and don't require the application of adhesives. Finally, an even lower cost alternative is to go with an "implant retained denture". 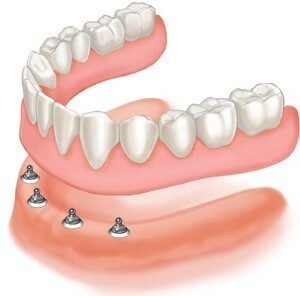 This procedure also uses implants, but instead of the denture plate being fixed directly to the implant abutments, there are clips that the dentures snap onto to keep them in place. The key difference here is that you will still remove your dentures when you sleep or when you need to clean them. The cost for implant retained dentures is €5,900. The choice you make should not be based on cost alone. You should carefully consider all the pros and cons involved with each choice. The best thing you can possibly do is consult your dentist for advice, discussing all your concerns fully and frankly. In this way, you can be sure of getting the best results for your individual needs.